I’ve been working on a small game that has a Player class and a Render class. The Render class needs to know about the Player class so that it can draw the player in the right spot. My first pass at this had a method in the Render class called UpdatePlayerLocation where I passed it the Player’s location. This seemed a bit inefficient. I figured it would be better if my Render class was initialized with a reference to my (existing) Player class, so that any time the Player location was updated my Render class would already know about it. All of my attempts to get this to work resulted in a compiler error, or the Render class only creating a local copy of the Player class, meaning my updates to the Player outside of Render were ignored by Render. I decided to create a small program to test my methods and figured it out. It’s extremely troubling how I got it to work. Let me demonstrate the wrong way (only a local copy created), the error way, and the right way. The general idea is that I have a class called SomeNumber that is initialized with a number, and has methods for getting and setting this number after initialization. I have another class called NumberPrinter that is initialized with knowledge of an instance of the SomeNumber class. NumberPrinter prints the number stored in the instance of SomeNumber class that it’s passed. 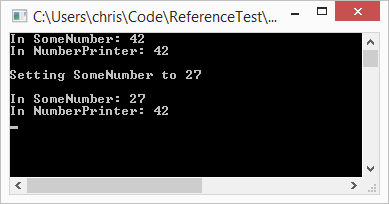 The program(s) below show the definitions of the SomeNumber and NumberPrinter classes, and the main() function initializes the classes, lets them print their number values, changes the SomeNumber number, and prints again. Ideally the number change in SomeNumber will propagate to NumberPrinter (propagate is the wrong word since it’s just a reference, but you know what I mean). The second printout of SomeNumber and NumberPrinter doesn’t match. This is because the class definition of NumberPrinter is wrong. It looks like it’s being initialized with a reference to a SomeNumber class instance, but it seems that setting a local (non-reference type) instance of SomeNumber to this passed reference only creates a class-local copy. mSomeNumber becomes a brand new instance (copy? ), and isn’t affected by anything done outside of NumberPrinter. This seems obvious in hindsight. So I figured that I should simply not declare my private mSomeNumber variable to be a SomeNumber class, but a reference to a SomeNumber class. This leads me to the error way. I won’t copy/paste the entire program. Only the NumberPrinter class changed. The guy in the post wasn’t getting the same error (he was asking a different question entirely) but I noticed his code worked and he was doing pretty much the same thing I was doing. The only difference was how he was doing the initializing. This leads me to the right way. Yes, this is what I wanted! I sincerely thought that initializing class variables like that was a style choice, but it seems to be a rule for some cases. I’m pretty new to C++, and stuff like this eats up entire evenings. Thankfully I live in a time when StackOverflow exists. I’d have been super stuck not realizing that the word “initialized” can have different contextual meanings! I think that the colon marks the start of an “initializer list”. It’s not really the initialization that makes the varaiable a reference, but rather its declaration – notice how in the first code you used SomeNumber mSomeNumber; and in the final one SomeNumber& mSomeNumber; (note the ampersand).